Protective glasses and reading glasses are saved as one. You can not give up while working because metal fire powder does not damage expensive spectacle lenses. The percentage of reading glasses was the best percentage for me over what I used before. The part of the reading glasses is too low to use. Seeing other people's reviews, it seems to be relatively satisfying, but I can not use it. If the upper part, the part of the reading glasses is a little more wide, it may have been usable. To me, it became an unusable item. I was looking for this glasses. It is saved when far-field work comes out frequently. This review is about item#59031253. Purchased for the purpose of guarding the eyes from pollen and dust at bicycle commute. As mentioned elsewhere, the reading glasses part is narrow at the bottom and the boundary is also conspicuous, but the display of the hand clock or the cycle computer is well visible, and the fact that the part with no degree is wide is aided conversely. I will purchase additional. The part of the magnifying glass is still small. I have a bit of a nose rash. I feel heavier than before. Only one point is dissatisfied. "Reading glasses part does not enter sight! " Reading glasses lens is too low to go into sight. It is useless as reading glasses. Other than that, there are no particular problems, so it is a more disappointing item. I've tried taking prescription eyeglasses with presbyopic eyes so far that I can see the characters I could not see anywhere. 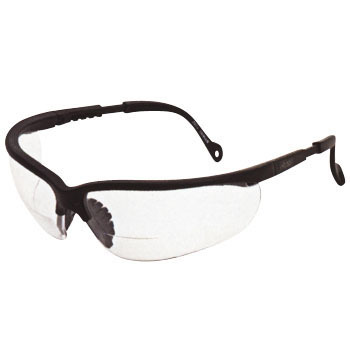 While working, I use a caliper depth dial gauge Before purchasing I attached 1.5 times the lens to ordinary protective glasses Purchased here with a trouble, surely the lens position is too low I will get used to it. Reading glasses are hard to see even if the parts that look like reading glasses are too low. I can not see it clearly. Reading glasses are not strange, but reading glasses are strange.